Apples truly are an extraordinary fruit. They come in a wide range of varieties – each with different colours, flavours, sizes and uses. To know what apple you’re looking for, here is a guide to make the best use of autumn apples grown at our Blush Lane Orchard and neighbouring orchards. What’s the difference between summer apples and autumn apples? Summer apples are ready earlier in the season, and are harvested at the end of July to mid August. They’re great for snacking, cooking or preserving, but they don’t store that well – so it’s best to use/eat them right away. Autumn apples, on the other hand, are harvested in September and October, and many varieties can be stored for months! 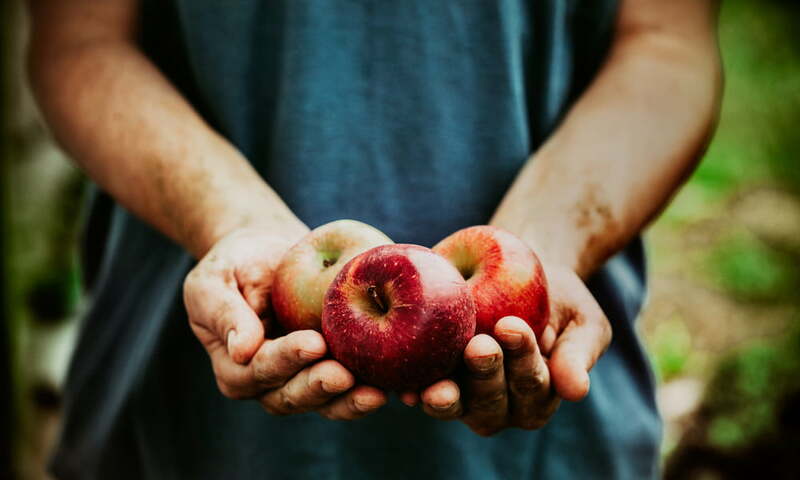 While we love all apples and sell both popular and less-well known varieties, here is a quick rundown of some popular apples to prep you for apple season. At the beginning of the season, we typically harvest McIntosh apples first. They’re crisp, tart and a treat to eat fresh. Since they don’t store as well as other autumn apples, it’s best if you enjoy McIntosh within a few weeks of purchase. After Mcintosh, next come Galas. These popular apples are well known for their sweet flavour. These are some of the most popular apples to snack on and for everyday eating. After Gala, Shamrock apples. These juicy, green apples look similar to Granny Smith, but have a flavour profile closer to McIntosh apples. Honeycrisps and Ambrosias are next, and then Granny Smiths. All of these varieties are excellent for long-term cold storage, but are also a treat to be eaten right away. Honeycrisps are sweet in flavour with hints of pear, and Ambrosias are similar flavour-wise to Golden Delicious. Sweet Orins are slightly less well known, but they’re delicious nonetheless! They’re sweet and crispy long after harvest. To identify them, they have a yellow skin with orange and white speckles. The last autumn apples are Fujis and Pink Ladies, which we usually pick in October (sometimes they can stay on the trees until the first big frost). Fujis originated in Japan in the 1940s. To identify them, they have pink flesh with speckles. The other late apple variety, Pink Ladies, come from Australia and originated in the 1970s. Since we harvest them very late and can store them for months, Pink Ladies make excellent cold storage apples! Although they’re great to snack on, too. Organic BC apples available now through fall!